I've just stumbled upon an #ancient #conspiracy of #international #theft and #stealing, and I'm about to BLOW THE LID OFF IT. It just so happens that Bentley's concept SUV from 2012 did not have styling influenced by the rest of the Bentley lineup, as you thought. It was something much, much more proletariat. 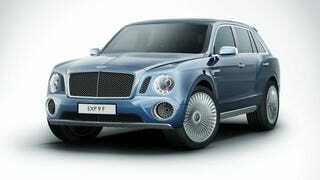 The styling of the Bentley EXP 9F Concept that debuted in 2012 was roundly panned, to the point where the SUV that Bentley's actually building has been significantly re-shaped. But what the people doing the panning didn't know at the time, because no one quite has my, well, let's just say "unique" panning capabilities that I've just discovered this morning, was that it was dismissed not because it looked silly, with its bug-eyed headlights, but because it looked exactly like the Englon SC7-RV. Based on a concept for a planned Chinese-produced update of the London Taxi, the SC7-RV and EXP 9F have an uncanny resemblance, and not just in the awkward names. And no, this isn't another example of a Chinese knockoff. The Englon actually came before the Bentley. Alright, alright, so there almost definitely wasn't an actual #conspiracy of #theft and #stealing, with Bentley's illustrious designers taking their cues from a Chinese concept of an update of the London Taxi. It's more of a case of convergent evolution, where both Bentley and Englon wanted to capture quintessential British style, and ended up with big, round headlights, and an enormous, in-your-face grille. But there are other instances of this convergent evolution. Plenty of cars throughout history look like they could be siblings, even though they aren't. And no, I'm not talking about a Ford Taurus and Mercury Sable looking similar, because they were fundamentally the same car. I'm talking about cars made by two entirely separate companies, on entirely separate platforms, that somehow still look the same. Got any other unnatural siblings? Show us in the comments below!